Biofortification – the enrichment of staple food crops with essential micronutrients – has been heralded as a uniquely sustainable solution to the problem of micronutrient deficiency or 'hidden hunger'. Considerable attention and resources are being directed towards the biofortification of rice – the world's most important food crop. 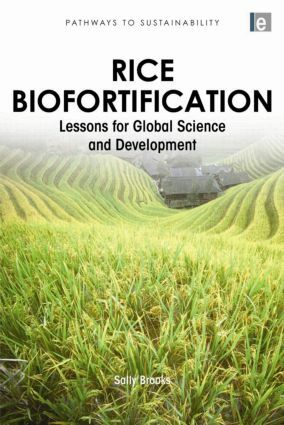 Through an in-depth analysis of international rice biofortification efforts across the US, Philippines and China, this book provides an important critique of such goal-oriented, top-down approaches. These approaches, the author argues, exemplify a model of global, 'public goods' science that is emerging within complex, international research networks. It provides vital lessons for those researching and making decisions about science and research policy, showing that if this model becomes entrenched, it is likely to channel resources towards the search for 'silver bullet' solutions at the expense of more incremental approaches that respond to locality, diversity and the complex and uncertain interactions between people and their environments. The author proposes a series of key changes to institutions and practices that might allow more context-responsive alternatives to emerge. These issues are particularly important now as increasing concerns over food security are leading donors and policy makers to commit to ambitious visions of 'impact at scale' – visions which may never become a reality and may preclude more effective pathways from being pursued. Published in association with the Economic and Social Research Council (ESRC). Sally Brooks has held various roles in international development as a researcher and practitioner. She has a PhD from the Institute of Development Studies (IDS) and is a research officer with the STEPS Centre, Sussex. Her research focuses on the social and institutional dynamics of science policy processes in food and agriculture.